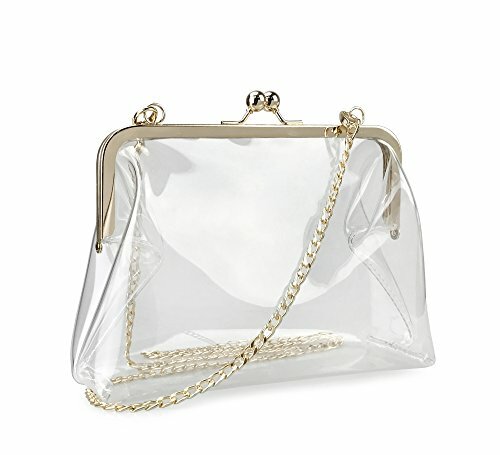 Your new go-to.Show this stylish sleek clear bag at Stadium, Concerts,Party,Some Work, and all the places where only clear-bags are allowed. Small Size perfected for Your Summer Holiday Travel.with a Detachable Chain，easy carry it from day and night! Your new go-to.Show this stylish sleek clear bag at Stadium, Concerts,Party,Some Work, and all the places where only clear-bags are allowed. Attached the Drawstring Pouch to organizer your personal items,Exclusive Design by HOXIS.Beware of Imitators. Notice: Please allowed slight colour deviation due to different displays.